The movie page in Movienizer displays information about a movie from your database. Some items of this page can be adjusted in the user interface settings window. Below the list of available interface scripts, there is a "Settings" button. Click it to open the settings window for the currently selected interface. 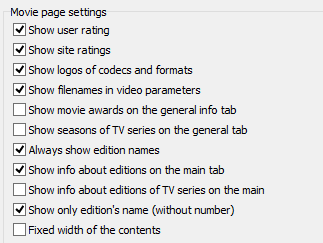 In the user interface settings window, find the "Movie page settings" area (highlighted on the screenshot above). We will describe the available options in more detail here. Show user rating. Shows the star rating under movie covers ("My rating"). You can click the stars to assign your own rating to the selected movie. You can disable this if you do not rate movies. Show site rating. Movienizer downloads information about movies from online movie databases. Along with other details, movie rating can be downloaded. 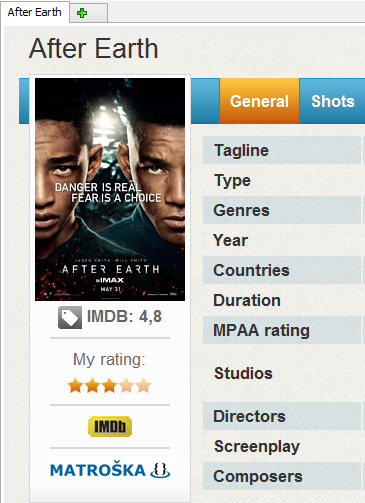 On the screenshot above, we can see that the IMDB rating of the selected movie is 4.8. Show logos of codecs and formats. If you add movies from files or DVDs/Blu-rays, some technical details are saved into the database. Movienizer can display logos of popular formats and codecs under movie covers, based on the technical details. On the screenshot above, a logo for Matroska is shown. Show filenames in video parameters. Shows the complete path and filename of the corresponding video file in the edition details. Show movie awards on the general info tab. The general tab is the main tab that is displayed as first every time you open a movie page (on the screenshot above, you can see that "General" is highlighted, too. Movienizer can show awards on this tab. Additionally, a special "Awards" tab is also available (if information about awards is available for the selected movie). Show seasons of TV series on the general tab. Like the previous option. Seasons of TV series can be displayed on the general tab. Always show edition names. With this option disabled, Movienizer does not show any edition name, if there is only one edition for the movie. Edition names are shown as titles before blocks of edition-related details (disc#, disc label, media format, etc.). Edition names also allow opening the folder where the corresponding video file is stored (the folder icon on the left). Show info about editions on the main tab. Just like with awards or seasons, Movienizer can show or hide edition details on the general tab. The special "Parameters" tab with the same information is also available. Show info about editions of TV series on the main. Like the previous option. However, it's a separate option, as TV series tend to have lots of editions (each episode is technically an "edition"), so it can be a very long list. Show only edition's name (without number). The previous screenshot says "Edition #1. Director's Cut". "Director's Cut" here is the name of the edition, "Edition #1" is its number (or rather a title including its number). If you enable this option, only "Director's Cut" will be shown. However, if no special name is assigned to an edition, it will still look like "Edition #1". Number of shots on the movie page. This allows to control how many images are displayed on the right (the "General" tab). Hide the navigation tabs on movie / person cards. This option does not affect anything in the Breeze user interface at the moment. Show the following tabs on movie pages. Here you can select which tabs are to be displayed on movie pages. 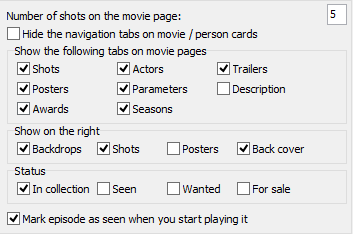 While the "General" tab shows combined information about a movie, other tabs allow easily accessing specific information like parameters, a list of episodes, awards, etc. Show on the right. This controls what types of images should be displayed on the right (the "General" tab). You can choose to display only shots, only backdrops, only posters, only back covers, or any combination of the above. 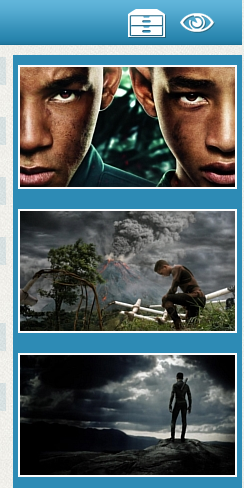 If no images of the selected type(s) are available in the database for the selected movie, nothing will be displayed. Status. This defines which status icons should be displayed on the right of the navigation band. By default, only the "In collection" icon is displayed. However, if you enable some other status (wanted, for sale, seen), the icon of the enabled status will also be displayed. Mark episode as seen when you start playing it. 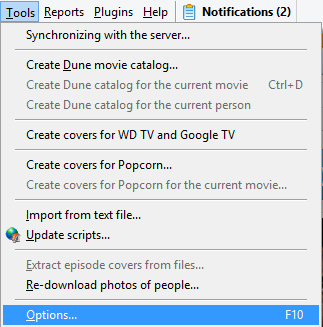 If you start watching an episode of a TV series directly from Movienizer, the program will automatically set the "seen" flag for it (even if you close it immediately after starting). If this is not the desired behavior, just disable this option.